This circuit is very similar with a car radio controlled toy with seven control functions: forward, forward-left, forward-right, backward, backward-left, backward-right, and stop. Also you can use this radio frequency circuit for some other electronic circuits that require a simple wire less motor controller. 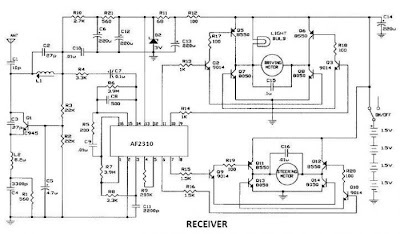 The remote control work’s at a frequency of 27.9 MHz and require a 9 volts power supply .This RF motor controller circuit consist from two parts a Radio Transmitter and a Radio Receiver . Both circuits receiver and transmitter are based on the AF2310 integrated circuit .For remote control contacts you can use some push buttons or a mini-joystick .Commands are controlled by different sets of electrical contacts that are used to encode a sequence of electrical pulses; the number of pulses depends on which command is being sent. An electrical circuit that is tuned to a frequency of 27.9 MHz creates a signal that is sent to the antenna when the pulses are active. The antenna converts the electrical energy into radio energy, creating a stream of radio energy bursts, which travel through the air and are picked up by and understood by the radio receiver in the car. The car antenna collects radio energy and transform it back into electrical energy.If the car is turned on then the radio receiver in the car is continuously monitoring the electrical energy from its antenna. 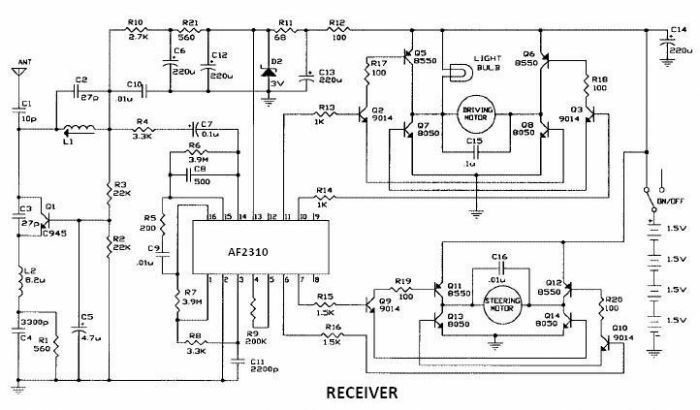 The receiver is a filter which is tuned to amplify any energy around 27.9 MHz and block energy the antenna picks up outside this region. If the Remote Control Transmitter is sending commands then its radio signal will be picked up by the receiver and converted back into the original pulse sequence. Decoding circuitry then determines which commands were sent by measuring the number of received pulses in the sequence. Signals are then sent to the motors to execute the commands. When operated with strong batteries and in an open area the range will be at least 40 ft. Obstacles will degrade the radio signal’s ability to travel through air and reduce operating range, but will never block it completely. In the car, weak batteries will reduce power to the Motor and degrade the receiver’s ability to filter, amplify, and decode commands from the Transmitter. When a command is received to turn left or right, a voltage is applied to the Steering Motor Since the Front Wheels are connected to the Steering Bar, the car will turn. To the turn the other direction, the voltage to the motor is reversed.The Driving Motor works the same as the Steering Motor. When a command is received to go forwards a voltage is applied to the Driving Motor; this voltage is reversed to go backwards.